Self-portrait of Peale (c. 1791) at the National Portrait Gallery in Washington, D.C.
Peale was born in 1741 between modern-day Queenstown and Centreville, Queen Anne's County, Maryland, the son of Charles Peale and his wife Margaret. He had a younger brother, James Peale (1749–1831). Charles became an apprentice to a saddle maker when he was fourteen years old. Upon reaching maturity, he opened his own saddle shop and joined the Sons of Liberty. However, he was unsuccessful in saddle making. He then tried fixing clocks and working with metals, but both of these endeavors failed as well. He then took up painting. One of his most celebrated paintings is The Staircase Group (1795), a double portrait of his sons Raphaelle and Titian, painted in the trompe l'oeil style. It is in the collection of the Philadelphia Museum of Art. 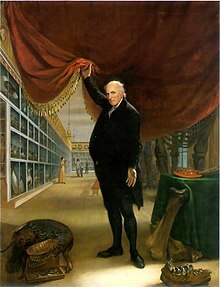 The museum would eventually fail, in large part because Peale was unsuccessful at obtaining government funding. After his death, the museum was sold to, and split up by, showmen P. T. Barnum and Moses Kimball. 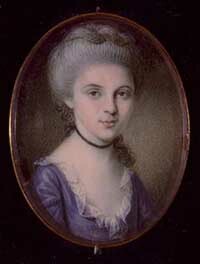 In 1762, Peale married Rachel Brewer (1744–1790), who bore him ten children, most named for Peale's favorite artists, male and female. The sons included Raphaelle Peale (1774–1825), Rembrandt Peale (1778–1860), who was another famous portrait painter and museum owner/operator in Baltimore, and scientific inventor and businessman, Titian Peale I (1780–1798), and Rubens Peale (1784–1865). Among the daughters: Angelica Kauffman Peale (named for Angelica Kauffman, Peale's favorite female painter) married Alexander Robinson, her daughter Priscilla Peale wed Dr. Henry Boteler, and Sophonisba Angusciola Peale (named for Sofonisba Anguissola) married Coleman Sellers. 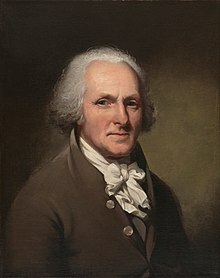 Peale's slave, Moses Williams, was also trained in the arts while growing up in the Peale household and later became a professional silhouette artist. In 1810, Peale purchased a farm in Germantown where he intended to retire. He named this estate 'Belfield', and cultivated extensive gardens there. After Hannah's death in 1821, Peale lived with his son Rubens and sold Belfield in 1826. Peale died on February 22, 1827, and was buried at the Saint Peter's Episcopal Church in Philadelphia. 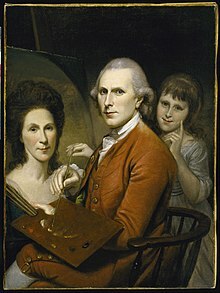 A Renaissance man, Peale had expertise not only in painting but also in many diverse fields, including carpentry, dentistry, optometry, shoemaking, and taxidermy. In 1802, John Isaac Hawkins patented the second official physiognotrace, a mechanical drawing device, and partnered with Peale to market it to prospective buyers. Peale sent a watercolor sketch of the physiognotrace, along with a detailed explanation, to Thomas Jefferson. The drawing is now held with the Jefferson Papers in the Library of Congress. ^ "Maryland Historical Markers: Birthplace of Charles Willson Peale". Maryland Historical Trust. Maryland Historical Society. Archived from the original on 12 April 2018. Retrieved 5 October 2018. ^ Barratt, Carrie Rebora, and Lori Zabar (2010). American Portrait Miniatures in the Metropolitan Museum of Art. New York: Metropolitan Museum of Art. p. 34. ISBN 1588393577. ^ Alexander, Edward P. (1995). Museum Masters: Their Museums and Their Influence. Rowman Altamira. pp. 43–72. ^ From Slave Ship to Harvard: Yarrow Mamout and the History of an African ... p. 149. ^ DuBois Shaw, Gwendolyn (March 2005). "Moses Williams, Cutter of Proﬁles: Silhouettes and African American Identity in the Early Republic" (PDF). Proceedings of the American Philosophical Society. 149 (1). Archived from the original (PDF) on 2015-05-01. Retrieved 8 March 2015. ^ Penley Knipe (2002). "Paper Profiles: American Portrait Silhouettes". Journal of the American Institute for Conservation. 41 (3): 203–223. doi:10.1179/019713602806082575. This page is based on the Wikipedia article Charles Willson Peale; it is used under the Creative Commons Attribution-ShareAlike 3.0 Unported License (CC-BY-SA). You may redistribute it, verbatim or modified, providing that you comply with the terms of the CC-BY-SA.